DAFFY DUCK, plotting giddily to out-maneuver Bugs Bunny, takes a crowbar to the signs announcing “Duck Season Open” in the establishing scene of Chuck Jones’s great Looney Tunes cartoon Duck! Rabbit, Duck! Our cue to the futility of the scheme, the detail that makes Daffy’s cluelessness apparent, is the fact that, as he works, he casually hums Edith Piaf’s “Le Vie en Rose.” Already in 1953, just a few years after Piaf wrote the lyrics, the song inextricably associated with her was a cartoon joke to American ears. In the five decades to follow, Piaf and her music still have much the same status here. In fact, time has only hardened the image of Edith Piaf, the dark little sparrow talk-singing songs about the fragility of life, as a cliché of brittle French insouciance. To this day in this country, anyone with a fond appreciation for Piaf’s work can express that taste only at risk of being taken for a strange duck. Piaf admirers of almost every feather would be gratified to read Carolyn Burke’s serious and mildly revisionist biography. Burke, the author of equally fine studies of the photographer Lee Miller and the polymorphic modernist Mina Loy, has treated Piaf’s life and work with the uninflated candor, unpretentious intelligence, and creative rigor worthy of her subject. She has researched both Piaf and her music thoroughly, processing volumes of letters, documents, contemporary accounts, and previous books to provide an account of Piaf’s career that is vivid in its details and persuasive in the arguments Burke builds from those details. The Piaf whom Burke presents is at first familiar but ultimately surprising: a diligent songwriter and profoundly original performer whose voracious appetite for men and kicks fueled, rather than depleted, her art. The fans of Piaf sure to be unsettled by Burke’s account are the many still attached to the longstanding image of her as a tragicomic martyr of excess, a Gallic cross between Judy Garland and Charlie Parker. That was the first Piaf I knew about—or thought I knew about, thanks to one of my roommates at NYU in the 1970s—and I resisted the caricatured idol of Existential Ennui at the same time I hunted the punk scene for idols of fatalism and decay whom I could call my own. Holding my nose to Edith Piaf, I bowed to Patti Smith, without realizing that Smith was doing Piaf with a New York accent. Nor did I realize how radical Piaf was in her time and place: she sang bluntly, without gloss, about the bleakness of the street life she knew first-hand in Pigalle. I didn’t realize that Piaf was singing not just in French, but also in the language of punks, early rockers, and the jazz and blues singers before them. As Burke points out in one of her book’s many small but telling observations, Piaf sang specifically with the titi accent of the lower classes, rather than the proper Parisian accent employed almost exclusively by singers and actors before Piaf. The sound of her voice, to French listeners in the 1930s, when Piaf began making records, was as potent a social statement in her sphere as the proudly African-American textures of Louis Armstrong’s singing were in America just a few years earlier. Her whole style of performance—untutored, a street style, plain-spoken not only in its plainness but in its suggestion of speech as well as singing—was non-traditional, anti-theatrical: in sum, anti-bourgeois. 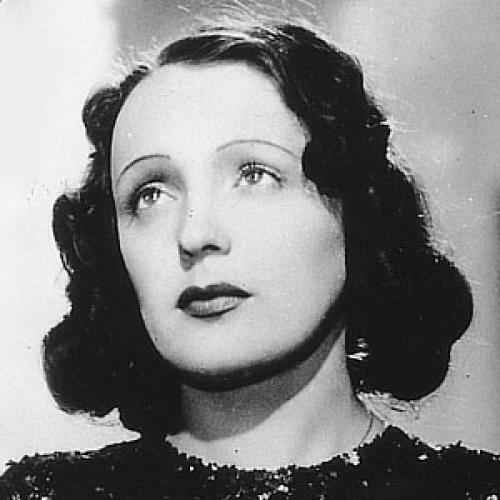 The school of song that Piaf helped establish as a movement, “la chanson realiste,” was a kind of musical social realism. Burke does an efficient job of situating this tradition in French cultural history, showing how the songs sung by Piaf presented candid, sometimes satirical portrayals of working-class life that “formed a counter-myth to bourgeois celebrations of the city,” then pervasive in popular music on both sides of the Atlantic. America had the blues; the French had Piaf. Virgil Thompson, in a review of Piaf for The New York Herald Tribune, which Burke quotes, measured Piaf’s art by the degree of its artlessness. “She is a great artist,” Thompson wrote, “because she gives you a clear vision of the scene or subject she is depicting, with a minimum injection of personality.” Yet, as Burke explains, Piaf’s music drew much of its power from its verisimilitude, and its effect of genuineness was reliant on Piaf’s projection of personality. The issue is really not how much, but rather what kind, of personality she injected into her music, and what she brought to it, in tons, was the personality (or, more accurately, the persona) of a life-battered little sage. ”Most of her songs ... seemed to come straight out of her life,” Burke writes, reminding us of Piaf’s essential role in the transformation of popular singing from its pre-modernist history as an interpretive art to an essentially modernist art of personal expression—or persona-expression. As I finished reading No Regrets, I wished only that Burke had provided more insight into Piaf’s inner life, the person beneath the persona of non-personality. Piaf, in her two memoirs (My Life and The Wheel of Fortune, both still readily available in English translation), cast herself as undyingly romantic and obedient to fate, laying claim to an impassivity that doesn’t quite gel with her infamous impenitence. With most of the witnesses to Piaf’s life gone now, we will never know more than we get from Burke, and I think it is much to her credit that she resists making unfounded inferences from yellowed-page gossip that is now impossible to verify or to dispute. C’est la biographie.